PROS: This phone is the loudest amplified phone you can buy. It lets you adjust the volume and tone frequencies. 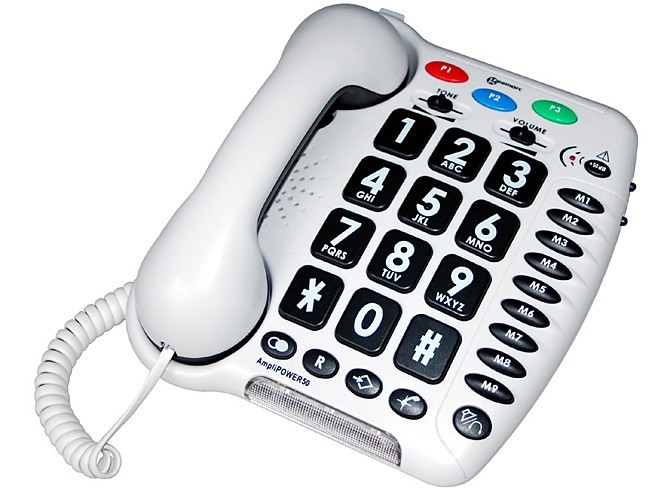 It has three emergency buttons you can program and also large buttons for easy dialing. Comes with wall mountable fixture. CONS: No caller ID, or answering machine feature. If you set the volume too high, you may hear some static interference. SUMMARY: The Geemarc AmpliPOWER 50 is an excellent option for anyone who is severely hard of hearing that has trouble communicating over the phone. The ringer is very loud so you won’t miss a call, and when you pick up, you will have a good level of amplification to adjust and customize the sound for your level of hearing loss. If you have mild to moderate hearing loss there are better options available in a similar price range, this phone is very loud and is meant for severe hearing loss only. The Geemarc AmpliPOWER 50 is the loudest of the amplified phones available. It gives users the ability to increase incoming sound up to 60dBs, so it is designed for people who have severe hearing loss; although you can adjust the amplification level to a lower level for moderate hearing loss. This model has most of the standard features of other amplified phones in this price range; large buttons, hearing aid compatible (when used with a t-coil), hands-free speakerphone, etc. The standard features combined with the high amplification level make this a reasonably priced option for anyone with severe hearing loss. The significant selling feature of this phone is the high level of amplification that you can get from it, although it does have other great features as well. The amplified hands-free speakerphone is a particular function that works very well. There are extra-large buttons that make it easy for anyone to use, especially people with visibility issue. If you have a hearing aid that is telecoil equipped, then this phone is hearing aid compatible for interference-free hearing. The AmpliPOWER 50 also offers the ability to customize the sound to your level of hearing loss. There is an adjustable tone control so the user can adjust the pitch of the receiving sound as well as a boost or reduce the volume control. Another standard feature that most amplified phones have is a visual ringer indicator, so you can see clearly that your phone is ringing and this phone does have that. The other main features that users seem to really like are the nine direct memory buttons, three emergency buttons and it is wall mountable. As mentioned above, this is the loudest amplified phone on the market. In a lot of cases, loudest doesn’t necessarily equal best, but with this phone, the sound quality remains good while you get the extra loud amplification. For incoming calls, you can get up to 60dB of amplification while the ringers can be adjusted to 90dBs (which means it is LOUD). The standard level of amplification for most amplified phones is around 30d- 40 dBs’. Some phones like the Panasonic KX-TG6592T are marketed as amplified phones but only amplify the incoming sound to less than 26dBs and is intended for someone with mild hearing loss. The AmpliPOWER 50 is a phone that is designed for users with severe hearing loss. The amplification level is adjustable, so if you are experiencing a degenerative hearing loss this phone is probably a good option. When you set the level that you want the sound boosted to the level remains fixed for the next time that you use the phone, so you don’t need to adjust it each time you use it, which is not the case with some other models of phones. There are some complaints about a static or hissing sound when you boost it to the highest levels, but in most cases, the level of amplification is so beneficial that you can get used to the static or adjust the tone and volume to lessen the interference. The phone is very clear, and it is easy to change to a comfortable volume. A surprising feature of this phone is the quality of the sound of the hands-free speakerphone. The speakerphone feature on this phone works so well that it is possible just to use the speakerphone and not the headset, which is something that a lot of users with hearing difficulties find very helpful. Some users complain if you set the volume too high you may hear some static interference.